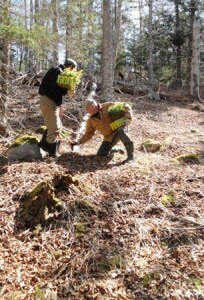 On April 23, 2011, Friends of Nature went out to Clay Island, which is owned by Chester Municipality (Nova Scotia). A large section of the island has a stand of yellow birch, but not much else. The FON objective was to provide more Acadian Forest diversity by planting 90 each of Eastern Hemlock and White Pine in the stand of yellow birch.